They’re consistently my only true night of the week to do exactly what I want. These carefree nights can happen, in theory, on any night, but Saturdays are when they happen most often, with the fewest consequences. Fridays also used to be like that — remember Friday nights? Unfortunately, the weight and stress of the workweek typically rears its head around 8:30 p.m. on said Friday, causing the body to crave a night of Blu-ray and Chill, regardless of whether you obey your body’s wishes. I say all this because I care about what manifests on my Saturday nights. Which is why this past Saturday was notable, because I acted very out of character. As in, I left Brooklyn at 6:30 p.m., en route to Newark, New Jersey. And I did this act of self-treason alone. And I did this for work, to cover a concert. And I did this alone, for work, to cover a concert by Korean pop boy band BigBang, a group from which I had heard only one song prior to my trip, and that song I had heard only twice, and I wasn’t even convinced I liked it. The assignment self-haze is a part of my occupational DNA. I’m no stranger to it, for it also takes me to amazingly dark places that result in occasionally fun pieces for a reader who lucked out by not being the one who trolled themselves. My approach to Newark’s Prudential Center was by car. And as the car got closer, I realized that I was surrounded by fewer and fewer normal cars. To the front, to the back, and immediately to the right of me, limousines. SUV-size limosines. I felt like a chemistry teacher tailing drunk students to senior prom. What should have been horror in this realization actually begat humor. It was clear I was about to walk into a madhouse. When I got out of the car and attempted to find will call, all I could do was find new lines of people. And each line was long, but none was the line I needed. Sometimes, as I got closer to another line of people — people who always looked younger than me, but weren’t always “young” — I would occasionally hear English being spoken. Typically, however, I didn’t. Because I knew this was a boy band, I expected the gender split to be about 90 percent female, 10 percent male. From what I’d seen, however, it was pretty close to 50-50. There was an excitement in the lines, but also a panic. Because this show was set to start at 8:00, it was 7:50, and there were probably a thousand people outside. Will call was a poorly marked door. And for some reason no one was going into this door, but a long line was positioned in front of it, waiting in the general admission line. Feeling the rush of adulthood and an obnoxious “I don’t wait in lines”–ness come over me, I walked right to that door, opened it, and confidently walked in. About 50 kids in line followed me, which caused mayhem inside. I turned around and gave the security lady an apology shrug as I went to get my ticket. By the time I’d entered, it was 8:05. I was told the show was starting exactly at eight, but its running late was welcome and not surprising. I needed a drink, and maybe two, and was happy to learn there was zero line for every alcohol kiosk in the arena, because teens. As I paid for my two very cold tallboys, I heard the first arena-wide shriek. It was showtime. Turning to look for a stairwell, I was almost knocked over by a crew of eight teens racing to their seats. Their faces weren’t filled with joy but with terror — the terror of missing a second of BigBang. I felt bad for them but even worse for the hundreds of people still outside. Who knew when they were going to get in? When I asked a guard how to get to my seat, I was told to find the escalator. But I couldn’t find it, so I took the stairs — which led me to the wrong floor, which was probably why she told me to take the escalator. As I stood on the wrong floor, however, I had a balcony-like vantage point on the entrance, which was an ebb and flow of people racing to their seats, screaming at the air. It was incredible. And then, just like that, a second arena-wide scream. It must have been song two. 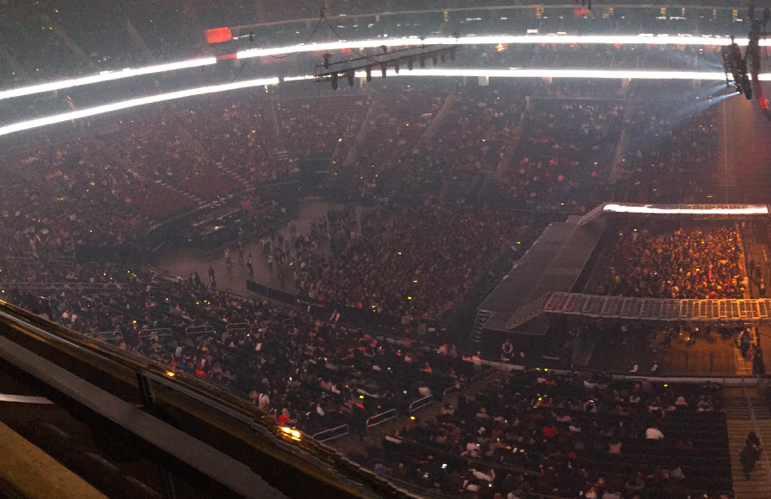 I needed to get to my seat — I didn’t come out to Newark to miss a concert, after all. When I made it up to the third level and walked into the arena, very little made sense. The lights were mostly up, the room was half full, and, most importantly, no one was onstage. There was a music video playing and people were singing to it, but that didn’t add up to the insanity I heard as I wandered the halls of the Prudential Center. Two minutes later, when that music video ended, it all made sense. Another music video started and the place erupted, as if the five BigBang members were actually onstage. This increasingly filled room was freaking out over very large music videos. Because of course they were. Because this was a boy band, after all, and that’s what happens. It was almost as if I didn’t grow up on TRL and witness what happened when Brian and Kevin would walk up to the glass three floors up from the street and just look down, causing teens to scream, and then cry, and then faint. This was becoming a salvageable Saturday night. Five more music videos played, and each time, the reaction was the same when the music video began, but each time louder because by the fifth video, general admission was packed and the available seats were nearly filled. Sitting there in awe for the next five minutes, I couldn’t get over the song, their live spectacle, their moves, the crowd, and the overall eccentricities of each member. BigBang is made up of five members: T.O.P., Taeyang, Daesung, Seungri, and G-Dragon. All five are in their twenties, so none are actually boys. And you can tell that when you watch them perform, because they very much have the confidence of adults. But not in the “let me shed my boyish innocence” way (which would pertain to them, since they’ve been a unit since 2006). More in the “we’re fly, and we know that because we’ve been told that by little girls, grown women, little boys, and grown men, the end” sense. As a group, they have found a sizable amount of success, winning awards in Korea, Japan, and throughout Europe. In the United States, G-Dragon has had the most crossover appeal, but throughout Asia all five have found success beyond BigBang, be it in music, acting, or as personalities. As BigBang, all five can sing, all five can dance, and a few (most notably, T.O.P. and G-Dragon) rap. And they do all of these things very well. Three songs into the show, I was completely sold on BigBang. And I had 16 songs left. But as my interest increased, it wasn’t really because of the songs (only a few words throughout this show were in English, just to give some idea of how good things have to be when you don’t know what is being said at you). To put in plainly, it’s because they are the perfect boy band for 2015. When it comes to boy bands, there are rules. And certain rules can never be broken, even if they are highly inefficient. One of those rules is that each member of the band gets a moment. Obviously, some bands have true stars and what ends up shaking out is a lead member and backup singers, but at some point, even the lowest member of the boy band totem pole gets some moment to do something. And not because of fairness for him — because even that last guy is someone’s favorite. And that fan paid good money to see their favorite have a moment in the sun. BigBang followed these rules, almost to a fault. On three occasions during the concert, a good 10 minutes was dedicated to each member walking up to the front of the stage, with the other four looking on, and giving the crowd similar prompts. Even by the fifth iteration of this, the fans did not tire. And that’s because BigBang is at equal strength at each position. It’s terrifying how good each member is. It’s like the ’92 Dream Team starting five, but with unlimited R1 turbo. When you watch it for the first time, you want to immediately think of the Backstreet Boys or ’N Sync or Boyz II Men or New Kids on the Block or New Edition, but none is the right comparison. If BigBang has one evolutionary ancestor, it’s most certainly the Floaters. You see, the Floaters are not the greatest boy band/man group of all time, but “Float On” might be the most beautiful creation a group of four to five boy-men with equal talent have ever made. It’s a simple song, with each member getting a verse of equal length, with the “Float, Float On” hook between each. But as each begins his verse, he alerts the world to his astrological sign, followed by his name, followed by what he offers the world (and how he wants to take you to Love Land). The first three are great. And some people’s person is Paul or Charles or Ralph. I know this because I have aunts. The fourth verse, however, while not enough to overwhelm the other three, is admittedly a standout. To be fair, G-Dragon is probably Larry from the Floaters. But in the same way Paul, Ralph, and Charles are also beloved and not far behind (and the favorites of many in their own right), so are T.O.P. and Taeyang and Daesung and Seungri. I know this because I watched and listened to the individualized screams from their constituencies, whenever it was their time to make a statement, rap a verse, do a dance move, be the center of attention. This equal spread of adoration and talent and style that BigBang has is what makes them a great boy band. But what makes their presence perfect in this moment is that they buck one of the main tenets of boy band-dom: the crutch that is choreography. Let it be known: BigBang certainly has choreography. And when they do it, it is clean and sharp and very appreciated. But when BigBang really gets going on a song, they are not front and center, doing the same moves. They are covering surface area, doing their own moves, dripping with their own concoction of indivudualized swagger, each living his best life off in his own corner of the stage. It was truly a sight to see — a boy band that in reality is a supergroup. In one song, you have G-Dragon doing the nae-nae, T.O.P. calmly standing with his cane holding court, Taeyang running up a catwalk in a manic way, Daesung jumping up and down, and Seungri off doing moves with the background dancers. Whichever caught your eye, you were suddenly looking at the coolest guy in the room and the most talented guy in the band. Watching it, I understood why their audience was made up of people who could only dream of being them or being with them. And as they went through their catalogue, doing both group BigBang songs and solo numbers, hopping from rap to R&B to pop to EDM to dubstep to a country-esque ditty to a song that I swear could be the no. 1 Christian rock song in history (“Wings,” the solo song by Daesung), they found a way to be everything. They found a way to make it seem like Drake, Usher, Katy Perry, and Taylor Swift concerts all in one night. It was quite a sight to behold. If you think they’re good, you also have to hear the new BigBang, Teen Top. I was disgusted. I didn’t want to hear that. I wasn’t ready to “explore the genre” right now. I was #BigBangHive now, and I wanted nothing more than to embrace this moment, this show, these men, this perfect Saturday night.